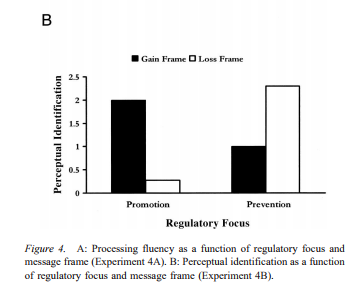 I want to walk you through a rather complicated paper that I think is pretty important; it’s called “Bringing the Frame Into Focus: The Influence of Regulatory Fit on Processing Fluency and Persuasion”. It’s by Lee and Aaker from 2004. The focus of the paper was the importance of what they call “regulatory fit”. Now this is not a term I would have invented, I personally think it’s clunky and doesn’t actually explain the concept, but I didn’t invent it, so I don’t get to name it. The person who did invent it was researcher E. Tory Higgins in the late 1990’s. The regulatory fit theory examines the motivation of people (what they want), and how they go about achieving that goal (how do I get what I want?). And just like there are liberal and conservative solutions to the same problems, regulatory fit theory says that people “orient” themselves when they solve a problem to either prevention, or promotion. Unlike politics, people don’t always go with prevention, or always go promotion; it depends on the situation and the problem. Prevention strategies, also known as “prevention focus” try to accomplish the same goal, but from a different mindset. Prevention tries to reduce losses, or pursue non-losses. It often is invoked during the fulfillment of obligations. Let me give you an example. Let’s analyze a road trip from Washington D.C. to Chicago from two different situations. The goal for both is the same, drive from the nation’s capital to Chicago. In one group is a newlywed couple from Sweden taking a holiday in the United States for the summer. In the second group are two people who work for a Heating and Air Conditioning (HVAC) company. They have to make a series of repairs for their commercial clients, and therefore have been sent on this driving route from Washington D.C. to Chicago. Both groups have the same trip, same stops, same time. So, in theory, their approach might be the same, but if you look at the situation from a regulatory fit theory analysis, you get different results. The fun Swedish couple are probably using a promotion strategy. They want to have fun! They want to maximize their time on the trip and see as many cool things as possible. They want to take risks and climb mountains and drive on the Blue Ridge Highway (as this author can attest is very cool). They want to see Gettysburg and stay at weird hotels along the way. They have aspirations. They want to maximize gains. The HVAC repair folks are probably using a prevention strategy. They just want the trip to go smoothly, and their clients to be happy. They don’t want hiccups, they don’t want flat tires, and they don’t want anything bad to happen. They want to minimize losses. In both cases it’s the same trip, and both times people want the trip to go as well as possible; but they are oriented in different directions. The same can hold true in a variety of political contexts. Right now, as I type this, immigration in the US is a huge issue. It’s a “hot-button issue” as they say. Generally, liberals in the US in the form of the Democratic party orient themselves in a promotion strategy on immigration. They are looking to maximize gains and talk about the benefits immigration can bring; more small business, greater cultural diversity, and higher economic growth for most (personal note from the economist writer, immigration is a net positive economically for the United States, but is a negative for some groups, mainly non-college educated white males). Conservatives in the form mainly as the Republican party take a prevention strategy on immigration. They talk more in terms of a prevention orientation to reduce loss, such as reducing drug imports, stopping terrorist threats, reducing job losses, and not overcrowding the social safety net. The reason the study that I mentioned earlier, “Bringing Frame Into Focus”, is important is that it dives into the effects orientation can have on how much a person likes a certain solution. The hypothesis they wanted to test was: do people treat solutions that are framed in the direction of their viewpoint more favorably? Does a better problem “fit” (either promotion or prevention) lead to a higher rating of the quality of that solution? We’ve had a lot of talk recently about the “ideas bubble”. If you’re conservative you only follow conservative people on Twitter, and only get your news from conservative news sources. And if you’re liberal you are only friends with other liberals and only get your news from liberal sources. The effect being that both sides are shouting past each other because there is no sharing of ideas. Many see this as a problem. I don’t want to frame it as positive or negative but it certainly is a “thing” that exists now. I feel confident in saying that the vast majority of Americans feel more polarized and split into factions, especially politically, than they have in the past. I think this paper gives a big clue into why this is happening on an individual level. Why it is happening now is a much bigger conversation about trust in social institutions and technology, and a whole host of other topics I won’t get into now. But to have a good mechanism for why people like to be so tribal in their solutions is important. To those who do see this polarization as a problem and want to try and fix it, let me give you this advice. A friend of mine specializes in racial inequality and gave me an interesting thought. We all have unconscious racial biases (check out https://implicit.harvard.edu/implicit/selectatest.html to take a test for yourself and see). She told me that having racial biases is okay on a personal level because we all are a little racist. What’s important is that we recognize in what ways we have racial biases, and then work and act to negate those instincts. The important work that you can do to stop racism is not to stop the negative biases that exist because those are often already imprinted into us through society at a young age. Our brains automatically make “us” and “them” categorizations. Only the passage of time can defeat that by redefining the “us” as all humans, or at least not seeing “us” and “them” on the basis of race. Rather, the work you can do in this moment is understand the racist biases you have, be honest with yourself and with others, and then work to not make decisions based on those feelings. Understand, accept, and account for them. It’s sharing that understanding that will actually work towards ending racism, not pretending that the feelings don’t exist. And that’s why framing is so important. We’ve talked about framing a lot, and this is another example that works qualitatively. The bias in how ideas are presented is fascinating because it is so antithetical to how we perceive ourselves. When we talk about number framing for example, it’s very interesting, and unconscious, but it’s sort of a mind trick. Look at this nifty magic trick I can do to make you act a certain way. But we take our core believes very seriously. The idea that I could manipulate what strategy you think would best enact your core beliefs based solely on how I presented my ideas, how I “framed” my ideas, is scary! And insanely useful to people out there who work in the marketing field. Again, it’s because of this orientation and fit theory. Ideas presented in a way that are in the same orientation you are in will “feel” like a better fit, and therefore you’ll be more receptive to them. So what did Lee and Aaker find in their research? It’s time to walk through it now. Their first experiment had small groups of 5-10 people presented with ads for Welch’s Grape Juice. After the ads people rated a few questions on a 7-point scale including their attitudes towards the brand, with 7 being highest and 1 being the lowest. People were split into a 2×2 condition. The first split was to get either a promotion condition, or a prevention condition. The promotion condition had language in the ad such as “growing evidence suggests that diets rich in Vitamin C and Iron lead to higher energy levels,” and other gain maximizing language. The ad in the prevention condition had language such as “growing evidence suggests that diets rich in antioxidants may reduce the risk of some cancers and heart disease”, and other language to minimize loss (of life due to a heart attack or cancer). The second split in addition to the promotion vs prevention condition was the framing condition. People were even given a tagline for example of “prevent clogged arteries!” in the gain frame, and “don’t miss out on preventing clogged arteries”, in the loss frame. As you can see, there was a nice split. 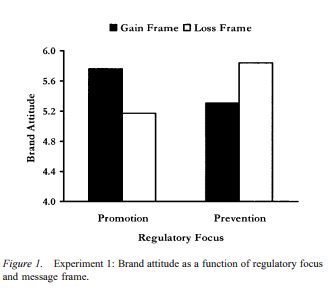 Those who were prompted with a promotional regulatory focus had a better response when presented with opportunity for gain, and those who were prompted with a prevention regulatory focus had a better response when presented with the reduction of loss. Both methods were effective, but how the message was framed changed based on the orientation. Interesting stuff, but there’s lots more. Experiment 2 and 3 were similar as Experiment 1, but they included a perception of risk. There again was an ad about mononucleosis (mono) this time, a relatively common but not fun disease. Exposure risk was manipulated by conveying that one could get mono from either frequent, or infrequent behaviors. Results? 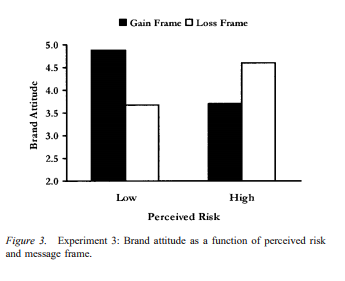 Appeals that are low in risk are more effective when presented in a gain or promotion frame. Appeals that are high in risk are more effective when presented in a prevention or loss frame. And this makes sense. When the risk of loss is low, like the newlywed couple, whose worse outcome is they have a “meh” vacation, we humans look to maximize gain. It’s a great biological adaptation strategy. Go take risks and maximize your potential rewards now while it’s safe. We naturally turn to a promotion orientation. When the risk of loss is high, like the HVAC repair team, whose worst outcome is that they destroy millions of dollars in business and get fired and foreclose on their house, the great biological adaptation strategy is “be safe”. Minimize your losses; just get out alive. We naturally turn to a prevention orientation strategy. This explains so many of our political framings as well. As I said earlier, immigration is a net positive for many groups of Americans. They adopt a promotion orientation. But especially for those populations who experience immigration as a much larger threat to their livelihood, their community, and their career opportunities (again strongest among non-college educated white males), they take a prevention orientation. They are worried about losing their job to outside competition. They have a much higher fear of loss. Therefore, messages that are oriented in the same direction that they are already facing will be much stronger. Donald Trump was so effective with his message because so much of the discourse his supporters were hearing from other candidates was not in the same orientation they were in. They didn’t want to hear all these messages about how great the US economy was doing after the recession, or all the great things other establishment Republicans were going to do once they were elected. They were, and are, in a prevention orientation. They were trying to minimize losses. President Trump soared in with a prevention message, that he would “make America great again.” That he’d stop drugs and people coming over the borders. That Washington D.C. was a corrupt swamp that needed to stop hurting America. His message was really, really effective. Very few other politicians were aligned in the same regulatory orientation as Trump and it carried him to the White House. It’s the flip side of the wave President Obama carried to the White House in 2006-2008; “Hope and Change.” Here was a very upbeat message, that if elected he can maximize the gains American already has. But it was even stronger than his rivals and did especially well with the young people in his base that were in a promotion, gain maximizing, orientation. This author’s bet is that he would not have done nearly as well had the election occurred in 2009, in the heart of the Great Recession when more people had probably politically switched to a prevention orientation on many political topics. There are countless more examples where this applies. But why is it so strong? “When a message frame is consistent versus inconsistent with the way in which individuals naturally think about issues that involve positive versus negative outcomes, the message becomes easier to process. This ease of processing is subsequently transferred to more favorable attitudes”. Connor Diemand Yauman, researched this idea that when people feel that information is easy to process then they process it differently (fluency) than when they feel that the information is difficult to process (disfluency). It’s a brilliant idea so I want to make sure you caught it. When a message is in the same orientation you are in, the message literally becomes easier to process. The brain doesn’t have to spend time and energy and resources figuring out why this information doesn’t align with what I’m already thinking. It all makes perfect sense in the world, and the brain speeds it along. It’s familiar. And when things are familiar, they are processed faster, which makes them “feel” better, and more correct. We’ve already covered a few studies in which recognition leads to more positive receptions. You process it fast, it feels good, and it fits with your self story. The orientation regulatory bias is that your brain simply says, okay, cool, that sounds right. I agree with that. And you move on. You like messages you don’t have to think about. You like messages that fit and make sense to your self-story. The smart researchers decided to test this theory! Because here we don’t simply spout ideas about why the world is the way we think it is… WE BACK IT UP WITH DATA! They wanted to test if indeed faster processing of a message (which they call “processing fluency”) when the message was aligned with their regulatory orientation. The researchers used the same setup as Experiment 1, with the Welch’s grape juice. However, this time they did so on a computer, with words that flashed on the screen that they had to write down. It’s called a perception test and is pretty common. 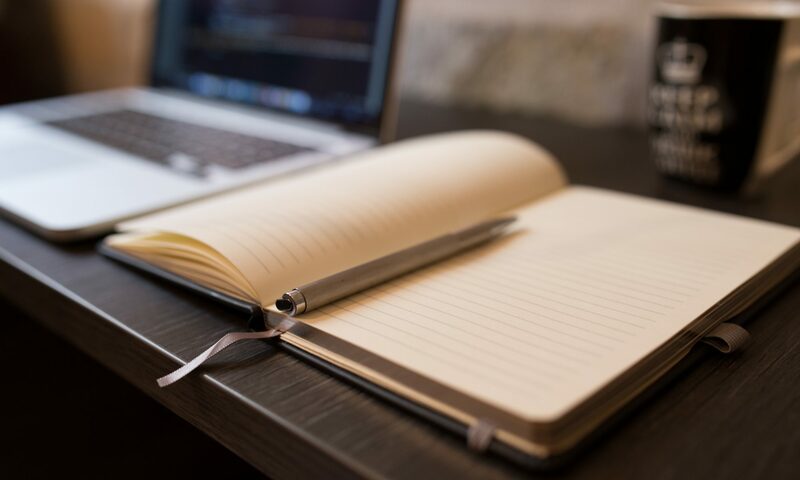 Because the words only flash briefly (we’re talking 50 milliseconds), the idea is that if you process some words faster than others, you’ll be able to perceive and write down more of those words. Simple enough right? There were lots of random words that flashed, and then 8 target words. Four were promotion focused (enjoy, active, energy, vitamins), and four were prevention focused (disease, arteries, cancer, and clogged). Remember the promotion group was told juice would give them more energy, and the prevention focus told they would reduce the risk of disease. You can see that in the promotion control group far more words associated with promotion were perceived, and in the prevention, far more prevention words were perceived. This is clear evidence that supports the hypothesis that faster processing of a message occurs when the framing was in the same orientation as person. What they are saying here is what I’ve already explained. The processing fluency, aka, the ease in which a message that is oriented in the same way your regulatory orientation already is contributes to the “feeling right” experience. Because it “feels right”, you rate that product, or that message as more favorable. Obviously this has loads of marketing potential. But it’s very important to know which orientation your audience is, or your message won’t land. That’s why it’s so easy to tell people what they want to hear. Selling Coke to people who already drink Coke is easy because that population of people already like Coke. It’s a much harder task to try and get people who think soda is bad for you to drink Coke. People have self-regulatory orientations. On different topics they can either have promotion orientation, to maximize gains, or prevention orientation, to minimize losses. When messages are framed in the same orientation people are in, they are more effective and better received. This is because messages in the same orientation are processed faster, and therefore “feel” better. If you want to be successful in any sort of voting contest where it is between a few choices, it is best to use a message that is framed in the correct orientation as your target audience. If everyone is in the same direction, including your competition, be the loudest voice. Either be the most preventing loss, or the most maximizing gain to make yourself stand out to a “base”. If at all possible, do both! Be preventing losses to one crowd and maximizing gain to another. What makes for a persuasive campaign and message? 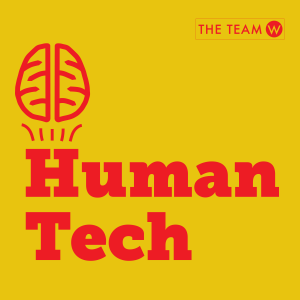 In this HumanTech podcast episode we talk about current and past election campaigns, and which persuasive principles work and why. 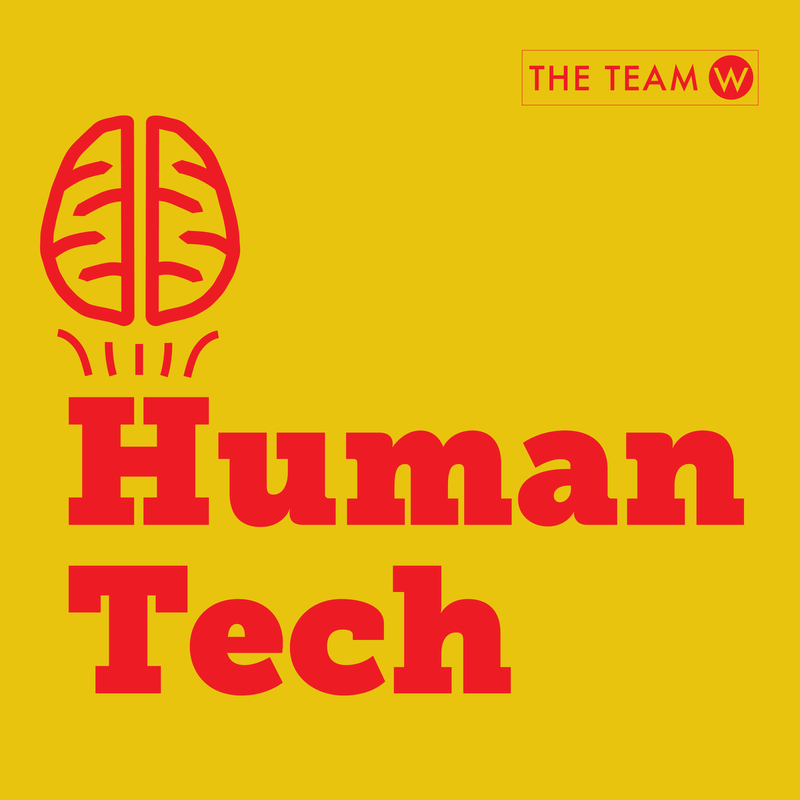 You can subscribe to our HumanTech podcast through iTunes, Stitcher, or where ever you listen to podcasts.